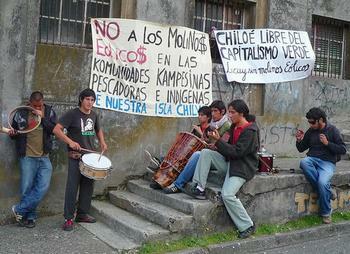 SANTIAGO, Chile, March 29, 2012 (ENS) – Responding to an appeal by indigenous communities of Chiloe Island in southern Chile, the Chilean Supreme Court has ordered the suspension of a 140 megawatt wind project on the island, the largest project of its kind in the country. Chilean-Swedish company Ecopower seeks to construct 56 towers of more than 100 meters in height along the Mar Brava coast of Chiloe island. These waters are inhabited in summer by a feeding population of blue whales, the largest creatures on Earth. 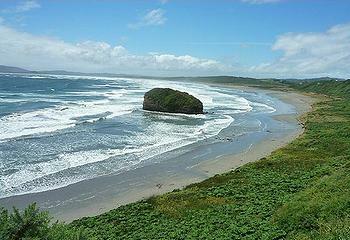 The high court determined that the wind farm, Parque Eolico Chiloe, was illegally approved on July 2, 2011 by the Regional Environmental Commission of Los Lagos region, led by the mayor of the region, Juan Sebastian Montes. Several Chilean civil society organizations expressed their opposition to the irregular performance of the Regional Environmental Commission that unanimously approved the development of the project without conducting the Environmental Impact Assessment required under Chilean law, says Elsa Cabrera. As executive director of the Cetacean Conservation Center, Cabrera works with and supports local groups demanding that Ecopower relocate the project and comply with national legislation that requires an Environmental Impact Assessment. In this context, the Supreme Court of Chile Friday welcomed the appeal presented by indigenous communities, as required under the 169 Convention of the International Labour Organization. In a unanimous decision, the ministers of the Third Chamber of the Supreme Court reversed the decision of the Regional Environmental Commission of Los Lagos. The the high court ruled that the decision to permit the Parque Eolico Chiloe was an “arbitrary act of the Environmental Commission” since it did not conduct a proper consultation process with the indigenous community. Congressman Fidel Espinoza, who objects to the irregular process of permitting and location of the wind farm on Chiloe Island, described the Supreme Court ruling as “historic.” He called for the resignation of the Mayor Montes, to punish him for leading the arbitrary adoption of the project last August without an Environmental Impact Assessment. Barbara Galletti is president of the Cetacean Conservation Center, and is also a member of the Scientific Committee of the International Whaling Commission. Last January she delivered a letter signed by more than 50 world experts in acoustics and whale research to Chilean President Sebastian Pinera, requesting relocation of the wind farm because of the impacts it would have on the population of blue whales that feed in summer in the waters along northwestern Chiloe Island. Galletti is also demanding that Ecopower comply with national legislation and conduct an Environmental Impact Assessment.